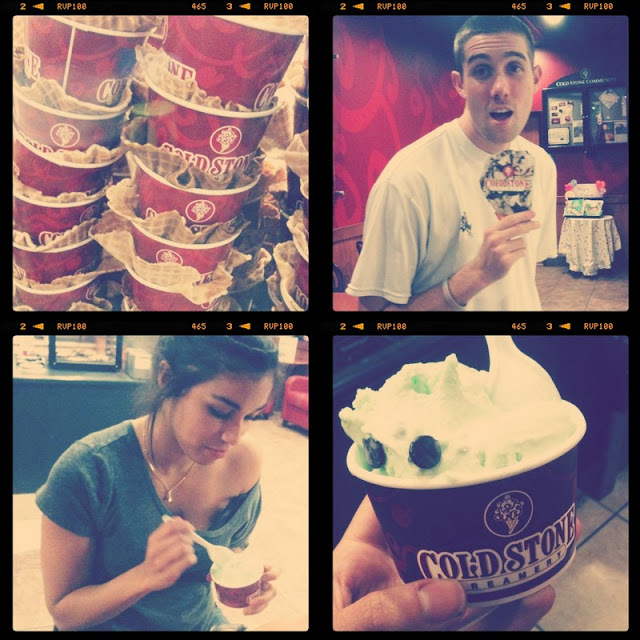 I got a coupon in the mail, for buy-one-get-one-free ice cream at Coldstone. I took it upon myself to force Chris to take me on an mid-week date to enjoy some frosty ice cream, which was a much needed break from this AWFUL heat wave we're suffering through in Phoenix. A number of things happened. The ice cream guy totally caught us taking douchy pictures while waiting to order, he threw away the coupon without looking at it & didn't know what to offer us so he had to dig through the trash, he added a measly 5 chocolate chips to my mint ice cream, accidentally gave Chris a small size, then tried to charge him for a big one and finally had to run chris' debit card four times before it worked. Apparently it was not ice cream guy's day. But when we walked outside we saw a coldstone ad that yelled "WANT TO GET CHOCOLATE WASTED?!" which totally made my world. Ha! And now some links to enjoy. I'm not really sure what I'd do with it, but I keep wishing & hoping this Farmer's Market Basket finds its way home with me. This home is not my usual style, but every image had me completely inspired. The deep colors & rich fabrics of the living room make me want to curl up with a good book. Photo bunting with your favorite pictures & snapped memories. I'm thinking of combining some of my best travel shots to hang in my bedroom! Chris ALWAYS makes fun of my hoarding tendencies, with the worst being pasta sauce jars. I can't help it! They must have a greater purpose...which I found. The fun invites created by this company are inspiring me to throw a party! I don't know what, or who I'd invite, or what I do at it....but atleast I'd have cute invitations, right? An end of summer picnic bash with some friends in the park. Download these cute invitations & get planning! via. Fun cocktail glasses for the glowing newlyweds in your life. I'm a sucker for a great mustache. This too cute dish to save your rings & jewelry from slipping down the sink while you're showering or washing your hands. I think I held it in the store for a full 10 minutes before forcing myself to put it down and walk away! By some wonderful news. I just found out that she is getting her own show!! GAH! I'm so excited. SO SO so excited. I had no idea the Ree was getting her own show! (We are totally not on a first name basis.) I love her blog. Thanks for sharing the news.